There was a letter from a certain Mr Zhuang Li-Hao that was published in the Straits Times forum page yesterday. Mr Zhuang felt that existing policies curb transaction volumes, but are by themselves inflationary. This is why prices continue to rise despite the various rounds of cooling measures. Mr Zhuang feels that both ABSD and SSD deter speculators, but directly increase the costs of ownership and transaction. And in a rising housing market, buyers and sellers will hold on to their positions. Sellers in particular, will build the ABSD and SDD into selling prices. As such, the number of transactions drop as prices increase. He proposed to replace ABSD and SSD with a capital gain tax of 100%, 75%, 50% and 25% respectively in the first four years. In this way, the cost of ownership remains the same. Speculators have no incentive to buy and sell since all profits are taxed, especially in the first year, while genuine buyers and sellers are not punished. The COV component for resale flats creates a volatile and unstable system as valuation is based on the last transaction. In a rising market, every transaction increases valuation by the COV amount. Mr Zhuang proposed to replace COV with cash over HDB price. The prices of flats that HDB sold to first owners are fixed. The new component will force buyers to fund the difference between the selling and original prices with cash or CPF savings, and not with loans. He felt that thus will immediately create a stable pricing system. The wife and I have bought and sold 3 different properties over the course of 6 years, prior to our current home. We only owned those properties for less than 2 years each BUT we were staying in all the property concerned during the period of ownership. So does that still make us a speculator as opposed to genuine buyer and seller? While we understand the (real) reason why our Government will prefer alternative form of measures to cool the market rather than imposing capital gain tax, is the later really a more effective measure to stabilize housing prices and demand? The proposal by Mr Zhuang is likely to kill the sub-sale market instantly and reduce activities in the resale market somewhat. But if it is indeed true that the current high prices are due to exceptional strong demand for mass-market homes from genuine upgraders with primarily HDB addresses, even the change-over to a capital gain tax will have a muted effect on buying interests. And speaking of COV and escalating HDB resale prices, the wife and I (wife in particular) believe that the whole purpose of subsidized public housing is to ensure that every Singaporean has a roof over their heads and to fulfill their aspirations of home ownership. It is not meant to be a mechanism for people to make (indecent) amount of money out of. We feel that one of the primary reason why prices for mass-market homes are being "chased up" to the current levels is because of the money that potential HDB upgraders can make out of selling their flats these days. As such, the Cash Over HDB Price proposal is an interesting proposition. 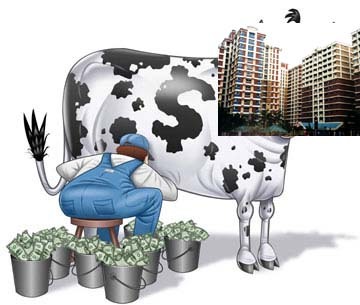 The public housing market should be "controlled" for both the new and resale markets. You can have all the free market mechanism you want in the private housing sector. The above are just our humble opinions as always. We love to hear what you think. 4 comments to ''Of capital gain tax and COV..."
Being an Economic student many moons ago... capital gains tax is a very sharp sword that kills everything on its way from speculative appetite to free trade. This is Pre-Coffee, so if it offends, I sincerely apologize. 2 things may occur -- both resulting in a worser economy for Singapore & the typical Singaporean on the street will be left poorer, not richer. Mr Zhuang's suggestion will crash the sub-sale of Singapore property market & kill free trade 100% & instantly. Foreign money will exit Singapore & go to other parts of South East Asia where there is no capital tax gains on property. Local investors will not invest in local properties, causing current properties to have paper loss. Buyers will be able to buy properties CHEAPER (when sellers can not hold on any more) but when they try to sell it, the same will occur to them; houses might become like cars --- depreciating assets. Everyone may just rent. There is no sense of belonging anymore in Singapore. No home ownership, no root, no loyalty to the nation. No more Singaporean dream. Mr Zhuang's suggestion will result in more expensive housing. Some speculators will not sell within 4 years to avoid capital gains tax. Then after the 4th year, they will jerk up the pricing to reflect their projected earnings over 4 years. Guess who will suffer ? The buyers, of course. But they will still buy because when they sell, they benefit as well. If the speculators do sell within the 4th year, there will still be price hike as the speculators will calculate into the selling price their would be gains or loss & pass it all to the buyers to bear. The price increase cycle will continues, but on a accelerating speed. This will result in more expensive housing across. - The rich who has strong holding power will become richer. - The poor can only rent. - The middle class? They may die servicing the loans & pass this burden to their children & grandchildren as housing becomes like a Japan housing situation. Then it will truly be multi-generation living in its true sense as it would really require 3 generations to service such a huge housing loan. Any wise government will not resort to capital gains tax on property without very careful calculation. Can't believe that some people are so myopic and naive when it comes to world economy & policies! They should really read up books, travel the world more before making such "Noddynomics" comments! Btw I'm referring to Mr Zhuang Li Hao's letter to the forum.